After four days of extensive sea-based operations in the Bay of Bengal, Ex INDRA Navy 2018 concluded. 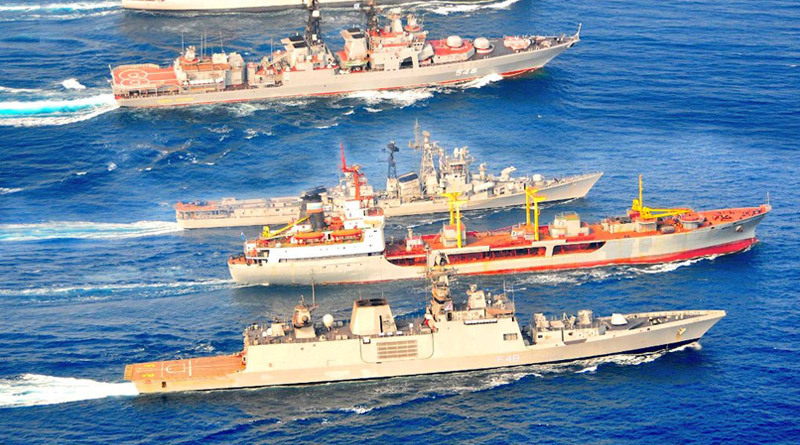 10 ships from the Indian and Russian navies operated together as Composite Task Force (CTF) during the exercise. The exercise was conducted in two phases from December 9 to December 16. The harbour phase was held at Visakhapatnam port from December 9 to 12 and included planning conferences, professional interactions, cultural visits, sports fixtures and formal calls between flag officers and senior officers of participating navies. Russian Federation Navy (RuFN) Ships Varyag, Admiral Panteleyev and Boris Butoma participated in the harbour phase. The sea phase was conducted from December 13 to 16. The thrust of exercises at sea was on Anti-Submarine Warfare (ASW), Air Defence drills, Surface Firings, Visit Board Search and Seizure (VBSS) operations and tactical procedures. The Indian Navy ships participating in the exercise were under commanded by Flag Officer Commanding, Eastern Fleet Command, Rear Admiral Dinesh K Tripathi. The Ships of the Russian Federation Navy were under the Command of Chief of Headquarters, Submarine Forces, Rear Admiral Mikhailov Edward Evgenievich and ships from the Pacific Fleet, based at Vladivostok. The Indian Navy was represented by INS Ranvir, a guided missile destroyer, INS Satpura, an indigenous frigate, INS Kadmatt, an indigenous anti-submarine warfare (ASW) corvette, IN Ships Kuthar and Khanjar both indigenous missile corvettes and INS Jyoti, a fleet tanker. In addition, one Sindhughosh class submarine, Dornier maritime patrol aircraft, Hawk fighter aircraft and other integral rotary wing helicopters also participated in the exercise. Ex INDRA Navy aims to increase inter-operational amongst the two navies, develop common understanding and procedures for maritime security operations. Initiated in 2003, INDRA Navy exercise has matured over the years with increase in scope, complexity and level of participation.